Welcome to Paradise! Memories are made here! 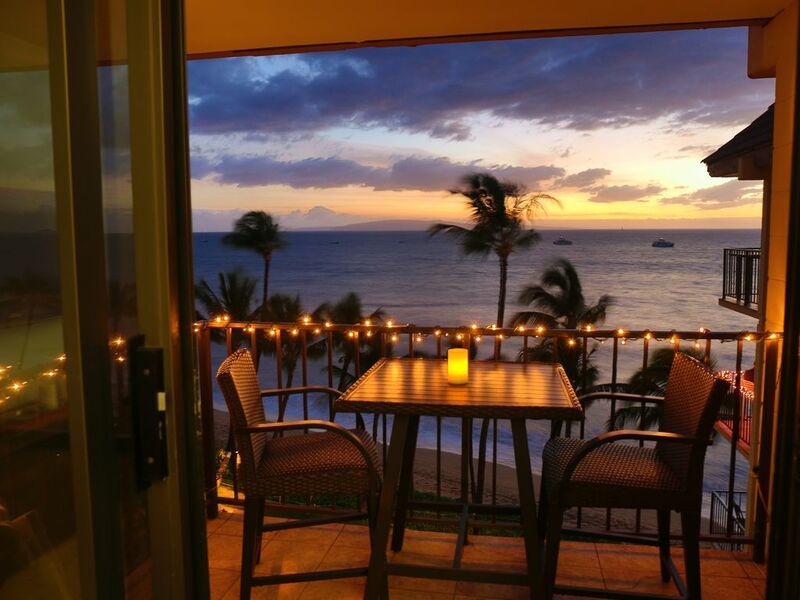 Come, relax, unwind, and enjoy the unforgettable breathtaking, panoramic ocean views from EVERY room in our beautiful top floor direct oceanfront, beachfront Kealia Resort Condominium nestled RIGHT ON Sugar Beach, just steps from the ocean. This is NOT a side unit! Magnificent west facing view of the neighboring Hawaiian islands of Kahoolawe and Molokini Crater, a popular snorkling/diving spot, from the lanai of #603. Equally magnificent Haleakala crater view on front walkway. Let the waves lull you to sleep every night. Feel the warm breezes and watch the swaying palms as you sip your favorite beverage or enjoy a bite to eat from your own private top floor lanai. In the winter watch the mother whales and calves frolicking and breaching. Let the sun's diamond reflections off the gentle Pacific waves mesmerize you as your body slides into total relaxation. Stroll along miles of sugar soft sand on Maui's longest walking beach. Mirrored walls envelop you with breath-taking ocean views. Kealia is the perfect quiet, private resort condominium for honeymooners, couples, seasoned travelers...anyone! Next to the Kealia Nature Preserve, so no buildings for three miles to the northwest. Totally remodeled, in August of 2017 with all new kitchen cabinets, backsplashes, Silestone quartz countertops throughout, new sinks, kitchen, faucet, refrigerator, showerhead, linens, towels, kitchen utensiles, etc. We also repainted the entire unit. It's been professionally decorated with bamboo flooring, all stainless steel kitchen appliances and high-end furniture and furnishings throughout, stripped and resealed tumbled marble tile in kitchen and bath, tub, vanity, vessel sink, huge, full-sized separate washer/dryer in the unit so you don't spend your vacation drying 2 beach towels at a time and totally updated to reflect more of a serene, romantic modern tropical feel. Our photos of the unit are updated in August 2017 after a remodel and show exactly what you will see when you arrive, with no surprises. We have a free state-of-the-art secured N+ wireless router for simultaneous video streaming/gaming on multiple devices like smart phones, computers or iPads, etc. The unit is fully stocked with EVERYTHING most people would want or need from all beach and snorkel gear to spices, cooking utensiles and ALL paper and cleaning supplies, including those for the washer, dishwasher and bath/shower. We haven't forgotten anything! We live in Kihei in case you need anything else to make your stay with us perfect. We are available 24/7. Your complete satisfaction is important to us. Our goal is the exceed your expectations. We 100% guarantee your complete satisfaction. We are very proud of the fact that we have many guests who return every year and we have the most booked unit in the Kealia Resort. We have taken great care to make 'Paradise Found' your home away from home. Parking is secured in a free parking garage out of the hot sun. Free elevator from parking garage to the 6th floor. We have owned this unit for 14 years and most of our guests have been to it several times and/or come every year. One stay and you'll know why. Our goal is to exceed your expectations and make your stay on Maui with us in #603 the vacation of your dreams. We never charge a booking fee. Covered parking in secured garage, local phone calls, calls to Canada, cable TV and secured wireless internet is all FREE! E-mailing is the best way to contact us. We will ALWAYS respond in NO MORE than 12 hours, usually sooner. If you call, please repeat your phone number. If you don't get a response within 12 hours, please contact us again. Remember, you complete satisfaction is 100% guaranteed. We 100% guarantee your satisfaction with this unit. Our goal is to exceed your expectations. We have many guests who return every year. Kept in top condition, clean and fully stocked with absolutley everything you will need, including ALL cleaning supplies and paper goods, spices, snorkel gear, all beach items, etc. This will save you a bundle. Less than 50 feet from the sugar soft sand. Safe swimming/walking beach on bay. Haleakala Crater from 6th floor front walkway. Breathtaking sweeping direct west facing ocean view. Direct oceanfront. NOT a side view. Answering Machine. Free local and Canada calls. Properly sized to easily cool entire unit. Filter cleaned every month. Ceiling fans in every room. Fully Stocked, including beach towels. Full-sized inside Unit 603. 4.2 cubic feet. Most units have a 1.5 - 3.2 cubic foot washer. Full-sized inside Unit 603: 7.5 cubic foot. Most units have a 3.4 - 5.9 cubic foot dryer. Free. Below street level parking garage in the shade! Ample supply of ALL types. State-of the-Art Secured Dual-Band N+ Router for simultaneous video streaming and gaming on multiple devices like smart phones, iPads, computers, etc. From parking garage below street level to top (6th) floor. Totally professionally updated. See photos. YES. Everything you'll need! Vitamix 5200 for those with a healthy lifestyle. Coffee Table converts to dining Table or Work Desk or eat at kitchen counter on stools or on Bar height table on lanai that seats 2. Two smart flat panel TVs/dvd players. Digital high defination cable feed. Yes, in bedroom reading nook. Hawaiian Music, Hana CD to tske in your car when driving to Hana. it tells you the best places to stop. CD players in living room and bedroom. Also iPod dock/ alarm clock in master bedroom. 2 snorkel sets. Beach chairs, towels, noodles, umbrella, coolers, boogie boards. Ceiling Paddle fans, Hair dryer, Iron & ironing board, iPOD/MP3 dock on clock/radio, Vitamix 5200, ALL cleaning supplies and paper goods provided, beach chairs, boogie boards, coolers, etc. NO SMOKING or PETS! This was our third stay at "Paradise Found" and it reminded us why we think it is paradise. The on-the-beach location is out of this world! The condo is a great home base for taking scenic day trips in all different directions. The condo is well appointed and the owners provide everything you need and more. Perfect. What else needs to be said ? Everything we needed and more !! We enjoyed our stay at Frank and Sandy's condo. The condo was very clean and well stocked. The gift basket of local goodies and the written welcoming on the white board was a nice, personal touch. We enjoyed getting up every morning and sitting on the patio and listening to the birds and the sound of the waves was soothing to the soul. This condo is easy to get to and is centrally located. We had no problem finding restaurants, shops and things to do. Frank and Sandy are great hosts and I recommend renting their condo for your stay in paradise. Beautiful and peaceful ocean front bliss! Sandy and Frank provided a warm welcome. They stocked everything we could possibly have wanted/needed. The location is perfect; diving distance to all the sites on our wish list. The condo was a peaceful retreat. The beach was beautiful and never crowded. Paradise Found lived up to its name! Mahalo Sandy and Frank for sharing your slice of paradise with us. The location is perfect, the view is unreal, and the condo has everything you need! The owners are great communicators and very responsive. We stayed here for a week for our honeymoon and are already talking about when we can stay here again. I would 100% recommend this condo to everyone I know! Whale Watching, Sunset Cruises, Dinner Cruises, Strolling the new Kealia Boardwalk, Waterpark, Aquarium, Sail boarding, outrigger canoe clubs adjacent to resort, paddle boarding, sailboarding, kite boarding, and sandwich shop + farmer's market +shave ice + ABC Store + gift shop within walking distance! Discounts for 3+ weeks in the low season, 4+ weeks, high season. Email us for exact pricing and details. A refundable Security Deposit check mailed to us is required 60 days prior to arrival. We will email the the details after a booking is confirmed.